Dr. Backhaus attended the University of Wisconsin-Milwaukee where he earned his bachelor’s degree in biomedical sciences with a specific focus on radiologic technology. Upon completion of his clinical internship and boards, he worked in the medical imaging department at Columbia St. Mary’s Hospital in Milwaukee. During his four years there, he gained experience in X-Ray, CT, MRI, nuclear medicine, and interventional radiology while in the emergency, intensive care and surgical departments. Throughout his radiology career, Dr. Backhaus gained an appreciation for the treatments hospitals could offer but also became keenly aware of the extensive void of patient knowledge of preventative care. He first encountered chiropractic as a result of a back injury from lifting a patient. 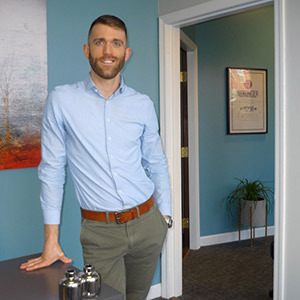 After learning more about how chiropractic care addressed the cause of an issue rather than masking it with medications, he decided to enter the profession. 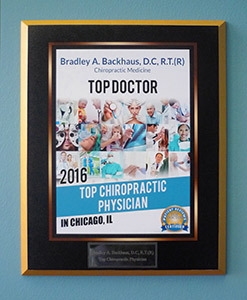 Dr. Backhaus earned his Doctor of Chiropractic (DC) degree from National University of Health Sciences (NUHS) in Lombard, Illinois. There, he learned the value of patient education and evidence-based medicine as part of a treatment plan. While in the program, he attended continuing education seminars, worked part-time in the admissions department and wrote a weekly blog that was featured on the university website. He was an active member of the Motion Palpation Club, Student American Chiropractic Association and Phi Theta Kappa. Dr. Backhaus completed his chiropractic internship at the NUHS Whole Health Center in Chicago’s South Loop. He also finished a rotation at the Chicago Salvation Army Clinic, which is a center for people struggling with substance abuse. During his internship, he earned his acupuncture certification from NUHS. He also obtained a Corrective Exercise Specialist certification from the National Academy of Sports Medicine. Committed to lifelong learning, Dr. Backhaus attends seminars to expand his knowledge, skills and expertise including the McKenzie Method of Mechanical Diagnosis and Treatment, Webster Technique, Instrument Assisted Soft Tissue Massage (IASTM) Technique, Kinesio Taping® and Dynamic Neuromuscular Stabilization (DNS). Additionally, he is a qualified posture specialist and holds a certification in acupuncture. Dr. Backhaus is an active member of the American Chiropractic Association and the Illinois Chiropractic Society and utilizes monthly webinars to keep up to date with what’s new in the field. Philanthropy is very important to Dr. Backhaus. He has volunteered for the Chicago Ride for AIDS, Chicago Marathon, Dare 2 Tri, and other races where he treated athletes before and after their events. Dr. Backhaus is actively involved with the Human Rights Campaign where he has been a member of the Chicago Steering Committee since 2014. He also co-chaired their annual gala in 2016 and 2017, which is their largest annual fundraiser. He has offered his time and financial support to the Howard Brown Health Center and the National MS Society. Dr. Backhaus also gives community presentations on topics ranging from the chiropractic profession to general health and wellness. In his free time, Dr. Backhaus enjoys biking, reading, gardening, and is a film and wine enthusiast. If you would like to learn more about chiropractic care, contact our office today. We would be happy to schedule you for a complimentary consultation!